Officially incorporates select fan mods into the game. The Binding of Isaac: Afterbirth was, er, ushered into the world a few months ago, and if you're not up to date with the roguelikey action game and its various incarnations, know that it's basically The Binding of Isaac: Rebirth but with a load of additional tweaks and content, and modding tools layered over the top. 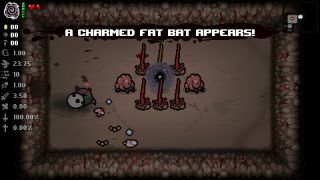 Before release, developer Edmund McMillen said that the game would receive monthly 'booster packs', adding select fan mods into the game via official patches, and while it's taken a little longer than expected, the first pack just went live a couple of days ago. McMillen details the free update here, revealing that it adds new items and trinkets, including a few by the Isaac creator himself. These include Buddy in a Box, which grants Isaac a randomised baby buddy, and Lil' Delirium, which randomly swaps your familiar every 10 seconds. For the next booster pack, which McMillen hopes will be out late next month, he's looking for new challenges, Angel Room items, enemies and bosses. So if you're interested in Isaac modding, get creating, as there's a chance your mods will be included in the game.